Recommended to: Readers who really enjoy science fiction and world building in their reads. 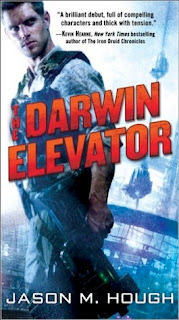 The Darwin Elevator caught me up in its premise initially. Anything compared to Josh Whedon and John Scalzi makes me take notice. I expected some action, space travel, and hopefully some characters I'd fall in love with. I'm a fan of Science Fiction. I hoped I'd be a fan of Jason M. Hough's work as well. The book starts out by introducing the reader to the current state of Earth. Ravaged to the point of near-annihilation, the last hope for humanity lies in one city. Darwin, Australia has become home to all that is left of the human race. I was a little lost at first, I'll admit it. The book takes off really quickly. Once I caught up though, I was immersed in this world. One thing I'll say for Hough's writing, the world building is phenomenal. I can't say the same for the plot, however. Things started out shaky for me when I learned the caste system in Skyler's world. The "immunes", those who can actually leave the planet, are for some reason at the bottom of the barrel. I was trying to figure out how the" non-immunes" managed to be the top dogs in this society. After that things became increasingly confusing. While the world that these characters populate is gorgeously desolate, the society doesn't really fit in it. Then there are the characters. I will be honest and say that there were some that I loved. Sadly, they happened to be the ones that were barely focused on, and one even died. The main characters, like Skylar, were all very shallow. It was hard for me to believe that Skylar, a man who has no self-esteem, was captain. It took me a long time to get behind any of these characters and once I finally did the book was near its end. I hoped for more. All in all The Darwin Elevator was a decent read. I would have liked more depth, but what was given to me was interesting enough to keep me reading to the end. I'm thinking that if the book had been a bit shorter, it would have been an easier read. Still, if you like Science Fiction, this might be a book that you want to try out.